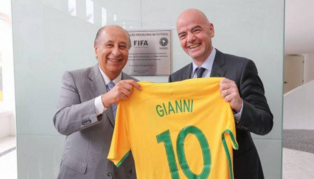 February 8 – In a seven-hour testimony former CBF president Marco Polo Del Nero has pleaded his innocence to FIFA’s Appeals Committee in a bid to avoid an enforced exit from Brazil’s supreme football body. Del Nero was banned for life from football by FIFA in April 2017 for taking bribes. In 2017 Del Nero (pictured with FIFA president Gianni Infantino in CBF office in August 2016) was suspended over allegations that he took inducements in exchange for awarding media and marketing rights. The 76-year-old had been one of 16 FIFA officials indicted for racketeering conspiracy and corruption in the second set of US Justice indictments in 2015. Following the initial arrests in Zurich in May 2015 Del Nero had fled from Zurich, and since then has refused to leave Brazil, even for the World Cup in Russia last year. His Brazilian FA predecessor Jose Maria Marin, who was detained in Zurich in the first set of arrests in May 2015, was sentenced to four years in prison by a United States federal court for corruption at the end of last year . On Thursday, Del Nero’s lawyers traveled to Zurich to represent their client as the Brazilian defended himself via videolink. Del Nero no longer expects to return to the helm of Brazilian football with his protege Rogerio Caboclo waiting in the wings as president elect, but still wants to avoid his punishment. FIFA had also slapped Del Nero with CHF1 million fine. Del Nero and his lawyers claimed that there is no evidence against him, because FIFA grounded its decision to punish him on evidence that surfaced during the US trial of Marin. That “indirect proof” would have led to a mere “assumption” that corruption may have occurred because of Del Nero’s relationship with Marin, alleged the defence, according to Brazilian media. It seems unlikely that the Appeals Committee will overturn the decision of the Ethics Committee, but Del Nero and his lawyers can seek final recourse at the Court of Arbitration for Sport.